Key Difference: In plant morphology, thorns, spines and prickles are all similar type of structures identified by their sharp and stiff ends. Thorns are obtained from shoots. Spines are obtained from leaves and prickles are derived from the epidermis. They all are related to anti-herbivore defense mechanisms of plants. In common usage, thorns, spines and prickles are all considered to be the same recognised by their pointed structure. However, in context to plant morphology they tend to be different from each other. Thorn is a woody and shape pointed modified stem. Thus, it can be regarded as a structure which is obtained from shoot. It is a sharp and woody branch. Spine is also a sharp pointed structure. It is the woody modified leaf or leaf plant. Thus, it can be seen as a structure derived from leaves. It usually forms just below a bud or branch or on leaf. Spines are formed as modified leaves which take the form of spines as the plant evolves. They replace the leaves of plants especially the ones which are living in dry conditions. It helps in reducing water loss. They are found on hawthorns. Prickle is a small, sharp structure which is derived from the epidermis, which means it is developed from outgrowth of the surface of epidermis or bark. These are usually very easy to remove. Prickles help the plant in scrambling over some other type of vegetation. One common example is of roses which have prickles. Therefore, one must not consider thorns, spines and prickles to be the same thing. 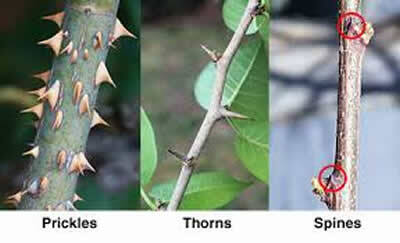 Thorns are modified branches or stems. Spines are modified leaves and prickles are simply extension of the plant cortex and epidermis. Unlike spines, thorns are deeply seated and have connection with vascular tissues. Thorns are formed from deeply seated tissues of the plant. On the other hand, spines are formed from tissues present externally. Spines and thorns are generally tough structures with their own vascular supply. It is therefore difficult to break them off by hand. On the other hand, prickles are easy to break off by hand. Prickles are extensions of the plants cortex and epidermis (the outerlayer of the stem).